Monsignor Ignacio Barreiro died on Holy Thursday, April 13, 2017, following a long battle with cancer. Below are some statements from Monsignor Barreiro’s friends and colleagues, and a selection of some of Monsignor’s writing and other works. Please join the HLI family in praying for Monsignor’s soul, and for consolation for all who mourn him. A brief biography of Monsignor Barreiro may be found here. Cardinal Burke with Msgr. Barreiro at the 2013 Rome Life Forum. Monsignor Ignacio Barreiro Carámbula was a man of remarkable talents who gave himself completely to Christ in the Holy Priesthood. In a particular way, he manifested his priestly character in his care for our brothers and sisters whom the world today considers “the least of our brethren”: the unborn and those who have grown weak because of illness, special needs, or advanced years. His work in the apostolate of respect for human life was outstanding and will bear lasting fruit. I had the great gift of visiting with Monsignor Barreiro for the last time on March 25th last, when I offered the Pontifical Mass on the Feast of the Annunciation at Saint Mary’s Church in Greenwich, Connecticut. Monsignor was in the hospital at Greenwich and was clearly conscious that death was near for him. He was serene in every way, offering me encouragement for my service in the Church and asking me to pray for him, so that he might have a holy death. He expressed, in a particular way, the desire to spend his last days with the Hawthorne Dominican Sisters whom he was confident would help him not only physically but, most of all, spiritually. Our Lord granted him his desire. May Our Lord, through the intercession of His Virgin Mother, now grant to Monsignor Barreiro the reward of the good and faithful servant. May he rest in peace! Living a life centered on Christ was Monsignor Barreiro’s goal as priest and servant of the Gospel. Anyone who met Monsignor could feel his passion for Christ and His Church. Everything flowed from this love and with profound gratitude for what the Father generously gave him; Monsignor devoted and exhausted himself for the mission of Jesus. Even while undergoing chemotherapy, he dedicated his free time to writing, teaching, and counsel. I would often find him at his desk answering emails, responding to the needs of HLI’s global pro-life family. “All for the glory of God,” he would say. Monsignor embodied the attitude of the Apostle Paul, “Forgetting what lies behind and straining forward to what lies ahead, I press on towards the goal” (Phil 3:13-14). In health and throughout his battle with cancer, Monsignor embodied this humble attitude and single-minded passion. He trusted himself to the will of the Father and sacrificed all for the sake of the Gospel. I am forever grateful to Almighty God for allowing my life to cross paths with Monsignor Barreiro’s. My life is enriched by the example of his priestly life, unabashed defense of truth and untiring dedication to the protection of human life. Maybe the best way to pay tribute to my friend is to use the words of the Apostle Paul I believe portrays best the life and priesthood of Monsignor Barreiro, “For me, to live is Christ” (Phil 1:21). 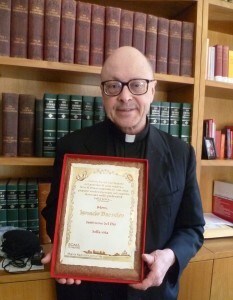 In 2013, Monsignor Barreiro received the Award for Life from the Rome Life Forum. For myself and for LifeSiteNews I would like to express our heartfelt gratitude to the Lord for Monsignor Barreiro’s friendship, his counsel, his heroic example and most especially his encouragement in the faith of Our Lord Jesus Christ. I remember fondly our meetings in Rome over the years and always being motivated by his fighting spirit. His solicitous help in arranging Vatican meetings and giving us treasured advice has helped LifeSite immeasurably. My only regret is that it was only recently in our many years of friendship that I was able to participate in his offering of the Holy Sacrifice of the Mass, for, as I found out only lately, this was his true love and strength. Rest in peace good servant of the Master, you gave yourself all to Him through His Holy Mother, may He receive you now from Her arms. Msgr. Barreiro with Dr. Joseph Meaney and his family at the Rome March for Life. “Father, if you are willing, take this cup from me; yet not my will, but yours be done.” (Luke 22:42) This scripture passage immediately comes to my mind when I think of my dear friend, Monsignor Ignacio Barreiro. I worked directly with him in the HLI Rome office for 7 years and we served as colleagues for 17 years. He always sought earnestly to bring his will into conformity with our Savior’s desires. When he became gravely ill, this abandonment to God’s will became even more striking. He did not seek extraordinary means to preserve his life, but he also did not neglect the normal treatments that were available. Most impressive to me was his serenity and even joy in the face of his life-threatening cancer and the painful therapies he endured. His one desire was to attain the beatitude of heaven, but he wanted to do as much good on earth as he possibly could before his death. His one complaint was when others tried to limit his activity because of his fragile health. That old proverb about there being plenty of time to rest after our death and not before was certainly his practice. Monsignor also impressed me deeply by his pursuit of virtue. He believed in the Aristotelian mean, the correct path that lies between the two extremes. Not a naturally patient person, he worked on this virtue continuously. He never rushed to take a decision but always took the time to think matters through. When he made a commitment, he always poured himself out to fulfill it. Perhaps the only vice Monsignor displayed often was a lack of moderation when it came to buying good books for the HLI Rome library. He had so many interests in theology, philosophy, history, bioethics, art, etc. that there were always more books to acquire. Most striking of all, was his love of the beauty of the Tridentine liturgy and desire to give all his many talents for the greater glory of God. I am deeply saddened to hear of the death of Monsignor Barreiro – one of the greatest servants of the Catholic Church and of the pro-life movement I have been privileged to know, as well as a wonderful personal friend. In his role as director of the Rome office of Human Life International, amidst countless other responsibilities as a priest and pro-life leader, he was an adviser and friend to the Society for the Protection of Unborn Children of the highest quality. His vast experience, his erudition, his unfailing charity, self-deprecating good humour, were always present in all his communications on both a professional and personal level. Above all, his priestly pastoral charity was always at the service of others – demonstrated by the deep interest he showed in all the problems and challenges which were brought to his door. SPUC’s International Director was fortunate to see our friend and advisor just a week before his death in Hawthorne, NY and was able to convey to him our heartfelt gratitude and assurance of prayers. May Monsignor Barreiro, the great 21st century apostle of Christ and the great champion of unborn children and the family, rest in peace! When I think of the first time I met Monsignor Barreiro, I recall it was before Mass in the Sacristy at the church of S. Giuseppe Capo Le Case, where he would celebrate Mass on Sundays. He was trying to be welcoming even though he had Mass for which to prepare. As soon as I picked up that I could be disturbing him, I apologized and asked to speak with him afterward. He replied with a kind smile that meeting someone is always a pleasure. As a young seminarian in Rome, I was following the advice of the seminary by exploring Rome, so I was looking for good priests. When I heard his homily that Sunday, I remember how much I loved the depth of it, how much he brought the Gospel to life. Clearly, this was the beginning of a long friendship because I had found a priest whom I could respect and seek to emulate in some way. Part of the preparation to the priesthood, in fact, is to have a sort of apprenticeship with older priests, and it is not even something one does consciously. It just happens. Whenever I would go visit him at the HLI office, he would be courteous and generous. It was apparent that he really cared for me, for my formation, and for the Church at large. He desired ardently that seminarians and priests be the men of God people need for the salvation of their souls, and he did everything he could to help us. Many of the people in Rome who knew him would frequently use the adjectives “intelligent,” “gentleman,” “pious,” “hard-working” and “generous.” Maybe they did not use them all in the same phrase, but these were the words unanimously used. The love and respect he gave others, he also received. As his successor in an office and library that he carefully and lovingly created, giving it the touch of culture and depth that it has, I am very grateful to Mons. Barreiro for everything he did for me and the HLI Rome Office. I hope that I may help it bear the fruit of which he would be proud. He will be greatly remembered in my thoughts and prayers. RIP. My path and Monsignor Barreiro’s crossed way back in his initial years as Director of the HLI Rome office. I was cutting my teeth then in far away Cameroon as an aprentice pro-life crusader. I very quickly fell in love with Monsignor’s passion for detail even on issues where I thought the available ordinary distinctions and explanations were sufficient. If Monsignor quickly established himself as a mentor, it must be said he set standards so high that only men with the highest dedication to truth and exactness could meet: his letters were artfully crafted, his respect for the sacred always on point, his diction measured and his judgement prudent. But Monsignor was no nerd. He enjoyed a good scotch and if you tried any adulteration of premium scotch with Coke, as I am wont to, then you quickly found out the good-mannered diplomat in the man had never really gone away. It had just been set aside for a higher pursuit. On Holy Thursday 2017, this pursuit reached its goal as Monsignor breathed his last on the same day as the universal Church commemorates both the institution of the priesthood and the Eucharist. He ran the race to the finish, he kept the faith. May the crown of glory and the promise of the resurrection and eternal life, be his now that his work is done. Requiescat in Pace, Monsignor Barreiro! Monsignor Ignacio Barreiro’s was my friend and colleague at HLI. Msgr. Ignacio was hired by HLI to establish HLI’s Roman branch office, Vita Umut ana Internazionale, which formally opened in November 1998. Its mission was to assist priests, seminarians and laymen who are studying in Rome by providing them with resources on moral theology, family life issues and bioethics. Msgr. Ignacio soon became a reliable and much sought-after consultant for Vatican officials and professors at pontifical universities and students of moral theology. Through his work in Rome he advanced the culture of life and surely his work will continue to promote and defend the sanctity of life around the world. I pray in gratitude for his faith, for his devout celebration of the Holy Mass, for his long years of priestly service and for his perseverance in his vocation. Jesus said: “Whoever eats my flesh and drinks my blood has eternal life, and I will raise him up on the last day.” Msgr. Ignacio adored Jesus in the host that he was privileged to hold in his hands and I pray that he now contemplates that same Jesus face to face. Monsignor Ignacio Barreiro is an example of a person who was willing to lend all his talents to the challenge of promoting a culture of life. The world is much better for his life and work. As we pray for him at his departure from us, we carry with us the inspiration of his example and dedication. RIP. I first heard of Monsignor Barreiro in 2009 when he was still stationed at HLI office in Rome. He was always ready to help with questions related to the teachings of the Church in life and family matters. At the end of 2010, when he assumed temporarily the position of President of HLI, he was always concerned about our work in Latin America and gave me the opportunity to commit myself further to HLI services in the region, for which I am very grateful. Ever since until he moved as pastor of a parish in Connecticut, he was always available for any consultation in Church related teachings. May the Lord allow Monsignor Ignacio Barreiro to be a new intercessor in our fight in favor of the right to life. I will personally miss Monsignor Barreiro – a highly intellectual, great, humble, faithful, and joyful priest. When he spoke and wrote, I always tried absorbing every bit of wisdom. He was always my go-to consultant every time there were hazy issues and doubts. I am forever grateful for the gift of Monsignor and his example in his long and faithful service to HLI. He had been a touching model of undying faith, faithfulness, courage, and humility. Even in his moments of pain, he strengthened us because there was never a tinge of sadness and regret, but always a smile on his face and passion to serve. His joy in total surrender to GOD’s will for him is truly a fitting witness to the world. It was always a great blessing for me personally to listen and converse with him – and even just watch him. I will always keep in my heart his utmost generosity in sharing with us his wisdom. Never was there a time when I consulted him that he did not reply right away. In life and death, he truly inspires us. May GOD grant him eternal rest in the company of the angels and saints in heaven. I got to know Monsignor Barreiro in 2011, when I began working with Human Life International. I visited him in Rome in 2013 and got to know him better when he returned to the United States after working as the Director of the Rome office. Msgr. Barreiro became not only a colleague but a friend. Monsignor and I were raised in different cultures and had different personalities. He was more reserved, but social and friendly. We shared a love for the faith, for the Church and a passion to defend human life. We worked on several articles together. We also liked to watch movies together. I was impressed by his intellect, sense of reverence and love for the Mass. Though he was ordained to the priesthood at a later age, he became the quintessential priest. How fitting that he should die on Holy Thursday! I will miss him greatly. Requiescat in pace! It is providential that the Lord called his faithful servant Monsignor Ignacio Barreiro to Himself on the Holy Day in which the entire Church begins the Most Holy Paschal Triduum of Our Lord and Savior Jesus Christ. As we all know, on Holy Thursday we celebrate Jesus’ institution of the Holy Sacrifice of the Mass and the Sacrament of Orders, the two most beloved Sacraments by our very dear Mons. Barreiro and the ones he was so faithful to. We here at VHI-Miami elevate our Mass offerings and prayers for his eternal rest and reward and for the consolation of his loved ones, and the entire HLI Family. And we do this with profound gratitude to him for his life in service to us all and to the Lord, Whose gift to the world he was. Posted in HLI News, News & Commentary. Tagged Monsignor Barreiro. Thank God for such a devoted servant of Christ (Truth and Life)! May he rest in peace. We were blessed to have Msgr with us at Saint Mary Church, Norwalk, Ct.the last year of his earthly life. He inspired, guided, taught and genuinely loved us. He was a Good shepherd. His reverence for Holy Mass, respect for Holy Eucharist, silence in the Mass, his fierce fight for Life from the moment of conception until natural death. A great example for the priesthood, he died on The anniversary of the priesthood, Holy Thursday. God bless you Monsignor. It was a privilege to work with you at HLI. Thank you for your ministry. “I have set before you life and death, the blessing and the curse. Choose life, then, that you and your descendants may live, by loving the LORD, your God, obeying his voice, and holding fast to him. For that will mean life for you.” DEUT. 19b-20a. Dear Lord, Monsignor Ignacio Barreiro chose life here in this world as he obeyed Your voice and fought for the least among us — our dear brothers and sisters in the womb. Eternal rest grand to Msgr Barreiro, O Lord. Let his example of love for you and your children encourage us to love you, to obey your voice and to hold fast to You so that one day we too may be with you in your Kingdom. Amen. May this good shepherd of souls rest in peace. What an amazing man and holy priest. Eternal rest grant unto him O Lord! Please remember our beloved Monsignor Ignacio Barreiro as he comes into your Kingdom. May God’s perpetual light shine upon him. May his soul, through the Mercy of God, rest in peace. Amen. Lord Jesus Christ, as we meditate on your passion and death today on Good Friday, may your Sacrificial Love spread throughout the world to all mankind for peace and harmony. We need You O lord Jesus Christ more than ever. Have mercy on us all. Amen. May you have peace everlasting. Monsignor Ignacio Barreiro was a good and faithful friend. I could always turn to him. He was also highly intelligent and worked hard at whatever task he took on. He would work to make, not a good presentation about an issue, but an outstanding presentation. He was thorough, disciplined, honest, and precise. I will continue to rely on the intercession of Monsignor Barreiro throughout my life. Thank you Monsignor Barreiro, for everything. You are greatly missed. Monsignor was a truly great priest of Christ. I met him during the HLI world prayer congress in Rome in 2010, when he was interim president. Gracious, discreet, and compassionate, he was always available to administer God’s mercy to all who sought the sacrament of Reconciliation, including his brother priests. Surely our Good Lord, who came “that we might have life most abundantly,” is richly rewarding him for his fidelity and charity. God rest his beautiful soul! Wish to note I had a friend long addicted to heroin who eventually contracted Aids from the needles. When that happened, he asked me to find a priest for him, which I did, newly ordained Fr. Barriero, who in the final months of the man’s life heard his confessions, gave him our Lord in Communion, & at the end, extreme unction. So good hope Father helped to get the man’s soul on the way to Heaven. A year or so ago Msgr. told me that development was among the most memorable & important of his priesthood. And as with many priests, despite Msgr.’s valuable public witness on so many levels, not impossible the quiet ones might resonate even more, especially should the junkie & the priest one day be together forever in the love of their Savior. I had the privilege to visit St Peter with Father . It was not the first time I was visiting and praying there but it was the first time I was guided to find the heart of the Church there to discover the beauty and the meaning of this mother Church. I had the same experience when we visited the Basilica of The Immaculate Conception in Washington my negative impression was totally changed by his way of presenting the deep meaning and real beauty of the presence of Mary in our country. He was full of knowledge and so sensitive of the beauty of our heritage as a Christian in so many different ways. And of course the latin Mass and Gregorian liturgy . May the soul of dear Msgr. Barreiro with the reserved crown of eternal life rest in the eternal peace! Amen. I remember him as inspiration priest, reverent to the Holy Eucharist, a pro-life stalwart, an intellectual giant who defended orthodoxy in all things and a great pro-life warrior. He will be missed. I knew him years ago in between seminaries when I worked for Human Life International. He remained an inspiration for me after I became a priest and would often look up his articles and activities. May the Lord Jesus grant that I may live some of the virtues that he embodied and be always reverent to the Holy Mass and Eucharist. After getting to know Msgr Barreiro some years back, We came to the conclusion that our Great Grand fathers probably walked the streets of Montevideo at the same time. We exchanged many emails over the last few years. I so much enjoyed knowing him. The entire Una Voce Miami chapter mourns the passing of this great humble priest who was both virtuous and brave. He was a true Thomist and a learned man of Tradition who prayed and worked actively to restore all things in Christ. Because of his education, experience, and talent, Monsignor Barreiro should have been appointed to serve in a high position in the Church’s curia in Rome, but his unwavering fidelity to Christ and to the Truth were simply too unbearable to those in power. Mons. bore all his many trials and sufferings with humble resignation, knowing as he did that in God’s eyes there are no anonymous heroes. He fought the good fight, he transmitted the Faith integrally and pure, he will forever be remembered as a true man, a true shepherd of souls, a true son of the Church. He will be sorely missed, but we remain here, ready and willing to continue the battle in his place.